When did you first come up with the idea for Card Captor Sakura? Ohkawa: We were close to finishing Magic Knight Rayearth, the manga we were serializing in Nakayoshi before Card Captor Sakura, when our head editor Yamonouchi-san (who has been so supportive) asked us to do another series with them. With Magic Knight Rayearth we wanted to create a series that was unlike anything they ever had before, so for Card Captor Sakura we wanted to make a Nakayoshi-esque series. My first impulse was to write a magical-girl series, but I actually didn’t know all that much about the mahou shoujo genre. But since I understand the feelings of girls who long for such things, I decided to give it a shot. How did you conceive the story and characters? Ohkawa: The heroines in Magic Knight Rayearth were middle-schoolers, so this time, from the very beginning, I wanted the heroine to be in the same age group as the majority of Nakoyoshi‘s readers (grades 4, 5, and 6). Moreover, I wanted the heroine to be a girl those same readers could look at and think, “I want to be like her”. However — and I mean this in both a good and a bad way — that wasn’t very CLAMP-ish, so I made the other characters in the series more like our previous creations. Tomoyo-chan and Kero-chan fit that role. Which means you created Sakura first. How did you decide what kind of a girl she’d be? Ohkawa: I wanted her to be great at sports but an otherwise normal student. *laughs* And I wanted her to be kind. At what stage of planning do the other CLAMP members start contributing? Mokona: When it’s time to start drawing, actually. Ohkawa: Since I don’t talk about the characters until it’s time to create their visual design, I take all the information I’ve gathered and have them design the characters based on the descriptions I give. Mokona: Ohkawa thinks up everything. Like their body build, their hair length, and even smaller details. Ohkawa: Same thing. I wanted our magical girl to have a mascot-type companion. But it wasn’t as if I had already decided on a cat-like design. Nekoi: I tried all sorts of forms, like dogs and squirrels. Please tell us the process you went through for creating each of the characters, starting with Tomoyo-chan. Ohkawa: I wanted a best friend who was in on the heroine’s secret, someone to whom Sakura could talk about her magic. That Tomoyo makes Sakura’s costumes comes from the mahou shoujo convention of the heroine transforming in every episode — but I wanted to try having a friend prepare the costumes. Ohkawa: I created Yukito-san in preparation of the ending of the Clow arc. Also, I wanted the heroine to have an older brother-ish person to long after. Such a warm, gentle character like Yukito is uncommon in CLAMP. Do you have any anecdotes from when you were designing the characters? Mokona: When we first designed Sakura, I had the impression that she was more genki, that is, more of a aggressive tomboy, and, unfortunately, in the beginning Sakura’s design was slightly off. Mokona: Ohkawa told me, for the art in general, to “use thin lines” and “don’t use tsuri-me.” ‘Tsuri-me” reffers to the kind of eyes Kamui has in X. *laughs* She told me to avoid using those kind of straight lines, and to try to express things through curved lines. Ohkawa: To unify the world view, I decide that kind of thing at the beginning. This is true for our other works. Because if I don’t, the other works we’re making end up, in spite of our best efforts, looking alike. You really do set all the details. Does this mean you also chose the backgrounds and the tone treatment? Nekoi: I looked hard for flowers we could use. I went through dictionaries, doing my best to find appropriate flowers. *laughs* I was trying to avoid using the same flower more than once in one chapter. Nekoi: There’s surprisingly few flowers that can be drawn cutely. Are there any flowers that you remember especially? Do you remember receiving specific instructions on the other characters? Mokona: I was told to make Yukito and Fujitaka to resemble each other a little. Ohkawa: Because it would show up in the plot later. Ohkawa: I plan the stories out from beginning to end, but I never talk about it to the other members. I just hand them that chapter’s script. Does that mean you design characters like Yue as they appear in the story? Mokona: I think I designed Yue about a month before the chapter he showed up in. Do you have any secrets on how you make Sakura so cute? Nekoi: Really, we do. We all pray. *laughs* But, drawing cute also depends on your mood, right? Nekoi: I think it’s like that for most drawings. When I’m drawing a smiling face I smile, when I draw someone crying I start wanting to cry too. Do you feel that way when you’re writing the scripts? Ohkawa: Even when I’m writing a very serious scene, my emotions don’t get dragged along. Ohkawa: Not one bit. *laughs* But, lately I haven’t been able to concentrate as much as I used to, so I change the background music and just like that I’m in the right mood. What music did you use for Card Captor Sakura? Ohkawa: I used a lot of female pop songs with cute voices. Yuuko Hara-san has a song called “Shoujo Jidai” [“Female Age”]. Everytime I listen to it I go back to when I first fell in love. It’s bittersweet. *laughs* That’s pretty much the kind of music I listened to. Did Mokona Apapa-san listen to any specific music? Mokona: When I drew for Card Captor Sakura I used to listen to the anime OST (Original Soundtrack). Ohkawa: I can’t do that, when I hear the OST I get into the anime mindset. Do all of you play your music out loud? Ohkawa: In my work space I have a stereo, so if we play anything out loud it has to be on that. But since there are times some of us don’t want to listen to what’s playing, we have our own headphones to hear what we want to. There’s also a separate drawing room we call “Siberia” where we can hide away. Where do you write the scripts? Ohkawa: In the work room, with everyone else. It’s where the computer is. Does this mean you have to write serious scripts in what sounds like is a fun room? Please tell us the scene you remember the most from Card Captor Sakura. Mokona: For me, it’s during the Athletics festival, where we find out how Tomoyo feels about Sakura. Up until then I had been drawing it so that it looked like Tomoyo was in love with Touya-oniichan, but that turned out to be wrong… I didn’t find that out until I received that chapter’s script. I was so surprised, “Ohkawa meant it to be that way?” I nearly fell out of my chair. Ohkawa: What left an impression on me, and I was the one who decided this, was Sakura-chan without the strands of hair on the top of her head as a middle-schooler. *laughs* She looked so different. It may have been the secret to Sakura-chan’s identity. Have you gone back to read the series now that it’s over? Mokona: Not yet. *laughs* I can’t look at our series until about two years after they ended, when I can calmly see it as someone else’s work. How do you come up with the mid-series character/story key phrases? Ohkawa: *laughs* Before I started to write Card Captor Sakura, I had decided to write a story filled with confidence for no particular reason. Because if you think that things won’t go well, that’s usually where things head. I thought I could add the reason later. I wanted it to be a “if you try your best, it’ll work out” story. But I didn’t start out with Sakura’s “It’ll definitely be okay” line in mind. It developed naturally as I wrote. In our works if you take one part, what the main character says, then that is what the work is trying to express. Since Sakura said that, I think that is what the series wanted to say. I often hear that Card Captor Sakura inspires cheerfulness and motivation. Ohkawa: If that’s true then I’m glad. In Card Captor Sakura there are certain relationships, like Tomoyo’s feelings towards Sakura or Yukito’s and Touya’s relationship, that are not typical boy-girl romances. How do you, the creators, feel about that? Ohkawa: Our works generally have a few main themes as well as other background themes I wanted to write. For Card Captor Sakura, and I don’t know if this is the right way to put it, but I wanted to write something that minorities would feel comfortable with. Depending on your point of view, Tomoyo-chan’s feelings for Sakura could be considered dangerous. Similarly, you can see Yukito and Touya as being friends, or as going beyond that. There’s also how Syaoran was, at first, attracted to Yukito, and Rika’s feelings [for Terada-sensei]. I took great care in how to portray all that. Ohkawa: I mentioned this earlier, but the series’s main theme is explored through the main character, so think of how Sakura-chan acts. For example, when she found out that Syaoran was in love with Yukito, she didn’t look at him strangely. She did consider him a rival, but she didn’t act as though it was weird. Or consider how Syaoran-kun is a foreigner. Sakura treats him as though he moved in from a neighboring town, and she admires him for being able to live alone– she never once considers any of this as strange. Sakura herself doesn’t have a mother, and she sees it as normal. I wanted a story with a protagonist who had an open mind towards different family structures, different kinds of love, and different perspectives from society. Ohkawa: Maybe it’s too much to hope that the younger readers will understand all that, but I do hope that they’ll understand, a little bit, by looking at Sakura-chan. If they can, from Sakura-chan’s example, learn how treat a child with only one parent or a peer from another country, I’ll be happy. Ohkawa: One last comment on the subject: I am glad that the readers are happy that Sakura and Syaoran got together, but that anyone would think it’s because they make a normal couple… it’s a little disconcerting. Sakura didn’t chose Syaoran because he’s a boy close to her in age. If Syaoran had been a girl, if they had been far apart in age, as long as he was still Syaoran, I think Sakura would have fallen in love with him. It’d sadden me if you thought they’re a good couple because they’re normal. Because of course you could have paired Sakura with Tomoyo. Ohkawa: There is that. It’s not because Tomoyo-chan is a girl that she didn’t end up with Sakura. Of course Sakura does love Tomoyo, but it’s not the kind of love she has for Syaoran. Moreover, Tomoyo wanted Sakura to be happy. Tomoyo saying “My happiness is Sakura-chan’s happiness” is quite memorable. Ohkawa: If you ask me, the ultimate love is, when you think either “I want you to feel the same way about me”, or “no matter what, I want you to be happy”. I’m certain that Tomoyo, in thinking about Sakura, did feel that her happiness came from Sakura’s happiness. And so she cast aside the “feel the same way about me” aspect of love. There may be people who think that elementary school children are incapable of such maturity, but there are many children who are that wise, and suffer for it. Any secrets you can let out now that the series is over? Ohkawa: More than secrets, there are things we decided that didn’t come out in the series. 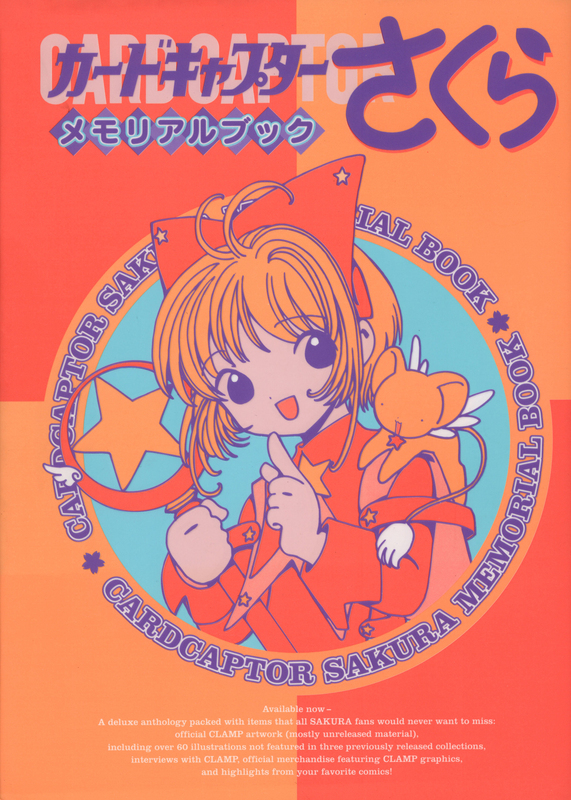 Igarashi: For the Card Captor Sakura anime staff we made a book of character histories. Like how many siblings they have, or what kind of things they want to learn. I bet X‘s must be incredible. Each one of you, please tell us who your favorite character is. Igarashi: I’ve always had fun watching Nakuru. Even if she didn’t appear much. Are there any characters you’d want as a husband? Igarashi: I’d marry Touya or Yamazaki-kun, he’d be fun in his own way. Ohkawa: Oh, yeah, Yamazaki-kun is good. Nekoi: He might make a good younger brother, since he can cook. Mokona: It’d be nice if he stayed as Yue. It has to be someone good at housework? Lastly, each one of you please state one thought on Card Captor Sakura. Nekoi: It was a challenge to see how shoujo a manga we could make. Igarashi: It was, in a large sense, a work of love. Ohkawa: Card Captor Sakura was, in many ways, a happy series. Nakayoshi let us work with the content as we pleased, we were blessed with a good anime staff, and they let us, without any pressure for a sequel, finish the story where we wanted to. With such good fans, it really is a happy series. Interview originally published in Card Captor Sakura Memorial Book (Kodansha), released on February 27, 2001.